Found 1581 Nail Clippers Cat Products. Pet Nail Grinder by for gentle and painless paws grooming, trimming, shaping, and smoothing for Dogs, Cats, Rabbits and Birds. Low Vibration and Low Noise Dog nail grinder is equipped with super mute motor but powerful with low noise and low vibration(lower than 60dB), so that sensitive pets will feel comfortable with this nail grinder, making nail trimming work easier. How to use: * choose a proper port according to your pet's nail characteristic. * when starting grinding, one hand holds the nail Grinder, meanwhile the other Hand holds the pet claws and puts the nail into a port gently for no longer than 5 seconds each time. * take off The grinder cover after trimming, cleaning the grinder wheel surface with an eraser or cloth to remove the nail powder. TIPS: Use the pet nail clipper to cut sharp fingernail parts first if your pet has extremely LONG or THICK nails because it will take long times to grind. If not, you can directly use nail grinder to polish pet nails. 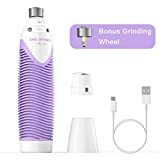 Specification: Charging Time: 5 hours Running Time: 5 hours Package Size: 8.5 * 3.4 * 1.8inch Package including: 1 x Pet nail Grinder 1 x grinding wheel 1 x USB wire 1 x Manual MONEY BACK GUARANTEE:If you are unsatisfied with our product, please contact us for a replacement or a refund. Are You A Dog Or A Cat Owner? Do You Want To Keep Your Beloved Pet Happy, Healthy And Well Taken Care Of? These Professional Pet Nail Clippers Are A Must Have Grooming Accessory For You! Wagging tails, purring, countless hours of playing and unforgettable, unique moments of love and companionship. If you are a pet owner, you are lucky enough to enjoy all of the above on a daily basis! Dogs and cats are a true family member and providing them with the best is a top goal. Apart from high quality, nutritional food and excellent health care, beauty and grooming are just as important for an animal's wellbeing. This is where we step in! ManTTa presents you with the ultimate pet nail clippers which are a must have for every pet owner. Professional Quality, Sturdy Construction And Safe, Easy, Precision Cutting This nail cutter is nothing like the ones you have tried so far! Featuring durable, thick, sharp stainless steel blades, these clippers can easily and cleanly cut your pet's nails without crushing them. In addition, the special, quick sensor safety guard will prevent overcutting and injuries, keeping your pet safe and happy. The ergonomic handles will make the whole process even easier, providing you with a firm, non-slip grip. Now, your furry friend can enjoy professional grooming services at home! Bonus Built-In File This amazing cats and dogs' nail cutter comes with a built in file! This means that you clean your best buddy's nails from rough edges. 100% Satisfaction In case using these pet nail clippers ends up in anything different than smiles and wagging tails, we will offer you a full refund. Click Add To Cart Now! Instructions 1/First clean the paws and feet of the dog, blow dry. 2/Find the right posture and hold the pet's foot firmly. 3/nail scissors cut the nails at a 45° angle, do not close the blood line. 4/If you accidentally cut the blood line, immediately use the cotton wool and hemostatic powder to stop bleeding. 5/ After cutting the nails, you can properly build the soles of the feet to prevent the hair from slipping too long. Are you tired of scheduling groomer's appointments? Or sick of paying through your nose for grooming or vet visits just for a nail trim? You now can do it easily and safely all by yourself in the comfort and convenience of your home. PROFESSIONAL GRADE CUTTING BLADES The blades are the most crucial part of any nail trimmers. Our high quality stainless steel blades are manufactured to ensure sharpness so you can cut your pet's nails in one smooth, clean action. Our stainless steel blades are durable and maintains its sharpness for long periods of time. It's no wonder why professional groomers and veterinarians trust and use these nail clippers! SAFETY FIRST We understand that dogs are not big fans of getting their nails cut and that's why we have designed these features our nail clippers for safety: - Fixed ring :puts the nail into the circle for trimming, and does not hurt the meat. The half moon shaped incision conforms to the shape of the pet nail. 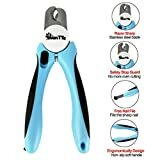 - Ergonomic non-slip handles: Comfortable grip for precision handling 5 Essentials for Safe Easy To Use Dog Nail Cutters: Nail cutters with a sharp blade and safety stop. Stainless steel is best. The clippers must feel comfortable and secure in your hand. Premium materials in the tool resulting in a high quality leveraged cutting action every time. 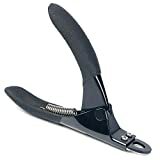 The dog nail clippers must be light in weight but robust and strong for long term use. 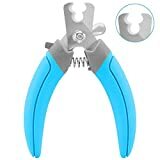 Why not choose our dog nail clippers? 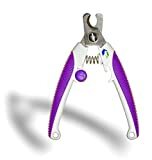 Why You Need a Pet Nail Clipper？ Afraid to Hurt Your Pet, But Know Those Nails Are Too Long? Pet whose claws grow too long are in discomfort - if your clippers are not super sharp, you run the risk of inflicting pain on your best friend. So what do you do? Most pet owners neglect their pet's nails because they fear hitting the quick, (Blood Vessel) causing bleeding! Now Remember The 4 Essentials for Safe Easy To Use Nail Cutters: - Nail cutters with a sharp blade and safety stop. Stainless steel is best - The clippers must feel comfortable and secure in your hand - Premium materials in the tool resulting in a high quality leveraged cutting action every time - Sold & Supported By A Company You Can Trust So Choosing Petrity Pet Nail Clippers！ Made of the highest quality materials in bright modern design we guarantee these tools 100%, if you are unhappy in any way. Don't Wait！100% Lifetime Guarantee You Have Nothing To Lose! Pet clippers are pruned every 1 to 2 weeks Usually nail clippers touch pet nails, and so on when pets are familiar with nail clippers. Confirm the location of the blood line before shearing, usually from the blood line 3MM. Do not cut too many black nails. Cut only one part of your fingertips and stop where your nails are bent down. Reward your favorite foods while pruning or pruning while sleeping. If love is too resistant, you can only trim one foot at a time, and don't force the pet to trim 4 feet at a time. 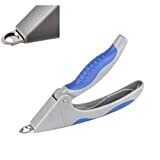 PetBonus Pet Nail Clipper,SUPER EASY and SAFE to use,45-DEGREE INCLINED DESIGN and Non-Slip Handle Make you and your small dogs or cats Feel Comfortable,Grooming at home SAVE TIME AND MONEY. 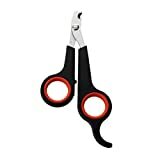 Amazon Buyers Recommended: "easy to clip the side that is left attached", "Cuts quickly and easily" "I like the curved blades. & I like that two comes in a package for a reasonable price","pretty sturdy" All these comments are came from the actual Amazon buyers who shared the same concern and love for their pet like you, telling you, "It is work great ! " Why pets need trimming regularly? Trimming should be a part of pet's daily cares, which need to be done routinely at least two weeks. Long toenails might tend to fall your pet and be the breeding ground of germs. Once the long toenails pierced into the skin, would it cause a cracking or inflammation. Instructions: 1.Put your pet on your laps, touch his/her head gently to help it calm down 2.Pick up one leg and start the trimming 3.Hold the clipper and the nail at a 45 degree angle 4.In case of making your pet bleed, avoid to cut near the edge of the fresh (the less transparent part ). Once it bled, use the medical cotton and hemostatic to cover the wound 5. When you done with clapping, remember to trim the hair under the feet, make it as long as the his/her footpads About PetBonus PetBonus is a brand dealing with pet supplies in medium and higher level. We dedicated to provide the best products to your pets and improve the quality of your pets'life. 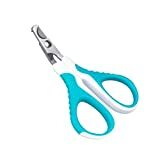 Pet Dog Cat Grooming Nail Toe Claw Clippers Scissors Trimmer Groomer CutterPlastic handle, easy to grip.Sharp blades are specially designed for pet. The nail clipper feature a scissor grip that relieves fatigue andmakes the job of cutting your pets nails or claws effortless.It makes the grooming job for your pet quick, easy and painlessNet weight:15g.Material: PlasticPacking Content:1 x Nail Clippers ScissorsNote:Light shooting and different displays may cause the color of the item in the picture a little different from the real thing. The measurement allowed error is +/- 1-3cm.